Dimebag completists won't want to miss it, but anyone else should try it first. Loud. Great sound. Clean/distorted layered tones. You may be left hungry for some extra gain. There may be better options for the price. Dimebag might not have had any input in the amp's design, but it's plastered with his signature graphics. It's barely landed, but Dean's Dime D100 has already lived an eventful life. It first caught our eye at NAMM 2009, then, two years on, a prototype was pilfered from UK distributor Bill Lewington by a light-fingered mosher at this year's HammerFest. Imagine our relief when two boxes bearing the Dime logo turned up at the office for our exclusive first review. There's been a fair amount of talk online questioning the validity of Dean's new Dime Amplification range. After all, Dimebag Darrell had no direct input into the amp's development. However, the range has been given the seal of approval from the Dime Estate. Also pivotal in the design process were two people who know a thing or two about Dime's sound. The first is Gary Sunda, the ex-Randall engineer behind Dimebag's favourite solid state amps. 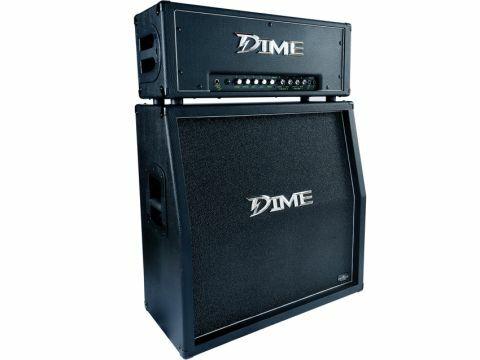 The second is Grady Champion, Dime's tech for 13 years, who was enlisted to test the amp during its development. The D100H has two channels, each with its own effects loop. There's also a shared four-band EQ and master Reverb. It's a solid state design, but valve snobs take note: this sucker is loud. Channel 1 is voiced for clean sounds: throw some modulation or delay into the effects loop and you won't have to tweak too much to get near the early '90s metal tones of tunes such as This Love. As much as we love Dimebag's clean sound, though, the main event was his blade-like distortion, making Channel 2 the biggie here. Like Channel 1, it has Gain and Volume controls, but there's also a Boost switch. Dimebag often said that he preferred solid state to valves because of the extra gain on offer. But if you're expecting to find the same levels of saturation as MXR's Dime Distortion, you'll be disappointed. Yes, there's a lot of distortion on offer, but even with high-output humbuckers, the Gain maxed out and Boost switch engaged, you might still feel hungry for some filth. Both channels and their effects loops can also be switched on together. It may take a bit of fiddling, but if you get the balance right you can create a layered clean-distorted sound for added punch. Dimebag's technique and tone have inspired millions of players worldwide, so it stands to reason that any signature Dime products cause a mixed reaction among fans. The D100H is a great sounding solid state amp that won't have any problems keeping up with the rest of the band. With it, you can achieve Dime's sound and a more-than-decent metal sound in general. While that might be enough for you, we'd argue that there are also plenty of solid state amps equipped with modelling and effects for a similar price (the accompanying D412SL or D412ST cabs are £449 each) that can get you just as close.